She thought about how odd her dream was as she told Jenny where she had hung her “missing” sweatshirt in her closet. She kept her tone neutral, knowing the day would be smoother if they didn’t start it the way she was tempted to start it. Her mind flashed over the day ahead while she stood in the shower, deliciously warm water sluicing down her body as she lathered with her favorite vanilla scented body wash.
She could hear her son, Jason, in the other shower, getting ready for the day. They would be zooming down the street to school soon. Not together. They were vetoing ride sharing lately. Her suggestion that they should keep sharing expenses was met with the answer that since they had jobs and paid for the gas they should be able to choose if they went together or not. Who could argue with that? “Yes?” He turned to look at her. As she watched his green eyes looking into hers it crossed her mind that it would be cool if his eyes were a deeper green. His eyes shifted to a deeper green. Whoa. Her own eyes widened as the green became the exact shade she was imagining. The room they stood in was round. There were clear tubes coming out of the walls every five feet, each ending in a metal tray. The entire wall was covered in luxurious purple silk. There were no other furnishings. 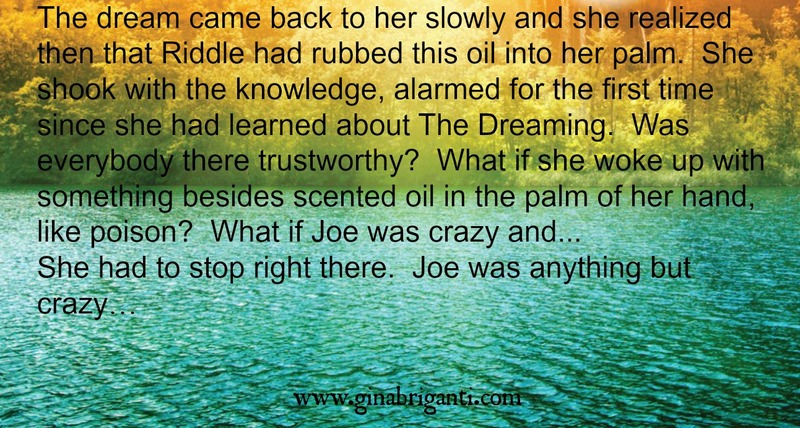 The Dreaming is available now in paperback and Kindle from Amazon.com. I have autographed copies available, too! “Let’s go.” He turned to walk out. Following him seemed like the best choice so she did. “Where are we going?” She noted that they were gliding, not walking, on hover boards. “Scratch the ‘where are we going,’ and tell me where we are. Please.” Her automatic training kicked in, demanding manners. “Don’t you know?” He spoke to the air in front of him, eyes straight ahead. Sarcasm bubbled up her throat, wanted to pop through her lips, but she held it back. “No.” Dana hoped she sounded polite. Are you receiving my newsletters, exclusives, and announcements? If not, you can easily sign up here.